All the World Finals information can be found here. Don’t miss the World Finals coaches training session on March 23rd! CTOM WF Coaches Training presentation can be found here. Looking for ideas? Check this out. 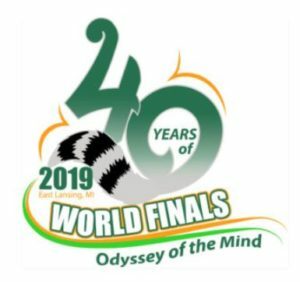 World Finals Merchandise – Orders Due March 30th! Merchandise pick-up/delivery: Again, we will be offering 3 locations for merchandise pick-up: Stamford/New Canaan, Brookfield, and Hartford area. You will specify your preferred location at the time of ordering. COU Housing Grants are designed to assist teams in experiencing the Odyssey of the Mind World Finals. A COU grant is intended to supplement efforts of teams to raise sufficient funds to attend World Finals. Funds are extremely limited, and only a small portion of applicants are awarded grants each year, but we do our best to ensure that teams who have qualified to compete at World Finals get to have the opportunity to do so. COU Housing Grants provide World Finals room and board packages purchased through Creative Competitions, Inc. Only teams electing to stay in official campus housing are eligible.